Rainmaking Club: Legal Marketing, Attorney Business Development, Expert Marketing: New Year's Goal for Lawyers: Keep Your Clients! New Year's Goal for Lawyers: Keep Your Clients! 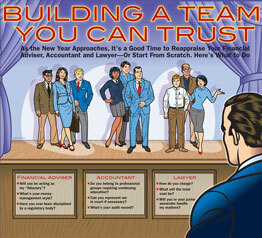 Reassess your lawyer for 2102 is advice the Wall Street Journal gave to readers over the New Year's weekend. If you are the lawyer, this should cause you at least a momentary pause to consider the strength of your client relations and legal marketing campaigns. Will you or a junior associate handle my matters? These questions are intended to cover personal estate management primarily, but they apply to many legal situations. Since this is a time of New Year's resolutions, here are some tips on best answers lawyers can give clients. Distinguishing your legal services on the basis of price is a race to the bottom. You will find yourself with a roster of cheap clients who are likely to leave you as soon as they find a lower cost attorney. Better to sidestep this question entirely if at all possible, and demonstrate your value on the basis of the strength of your relationship. Clearly define the services you will deliver, including a timeline and budget. You don't need to be the lowest-price attorney on the block to be perceived as offering a superior value. Deliver your services in accordance with your promise, and remind the client politely that you are doing so with clear invoices and activity reports. Respond to client emails and phone calls promptly. Be proactive in offering fresh suggestions or new alternatives to your client. Educate clients on relevant legal news with periodic and substantive newsletters or seminars. Go the extra step to look after the client's best interests whenever possible. Attorneys are under intense scrutiny today with all the lawyer ratings services, social media marketing, and 24/7 Internet communications. Those lawyers who stay close to their clients, while also fitting time in for business development, will be IN (like "in the money") for 2012. By the way, the article also suggests that clients evaluate their accountant and financial advisor as well as their attorney. Since this is a legal marketing blog, however, we will respectfully leave the other professionals to fend for themselves. Let's connect on social media, including Linkedin, Twitter @RainmakingLady, and Facebook. This was a well written and insightful post. Value is important and well as reaching out to your clients. However their is a counter-intuitive, but highly relevant business strategy called innovative disruption that is not addressed here. I would recommend you study the materials from Clayton Christensen, a Harvard Business School Professor and foremost expert on innovative disruption.